There are more than 30 countries waiting to join the China-led Asian Infrastructure Investment Bank (AIIB), in addition to its 57 founding members, the bank’s president said on Friday. The AIIB is now working on accepting new members, AIIB President Jin Liqun said at the Boao Forum for Asia on the Chinese island province of Hainan. “I think the new member issue will be solved before the end of this year,” he said. On Friday, AIIB chief Jin said he is “patient” in waiting for the US to decide on applying for membership. “Even if you decide not to join, that does not mean we cannot work together,” Jin said. 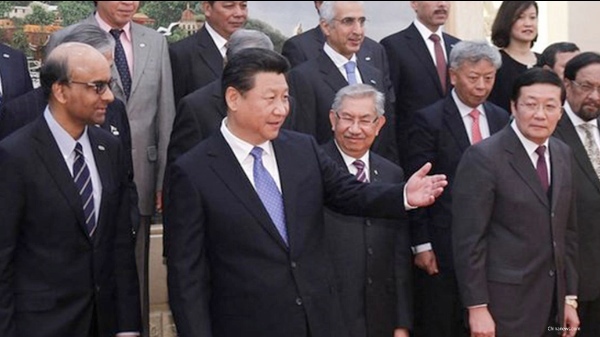 “I strongly believe AIIB should not be a new hotspot for the frictions between China and the United States. It is actually just the contrary. AIIB should be a new platform for China, the United States, Japan and many other countries to work together,” he added. Washington however was sufficiently irked by the decision by many of its European allies to join the China-led bank while choosing to ignore US warnings about the new lender’s transparency. The AIIB was officially established in December and it started operating in January. It is due to unveil its first projects in the first half of this year. “This is a historic moment,” Chinese President Xi Jinping said at the opening ceremony in January. Existing financial institutions can not fully meet every nation’s infrastructure and other demands, so new ones like the AIIB will be a great help, Jin said on Friday. The bank chief also said it is possible for China’s Hong Kong Special Administrative Region to become a member as a sub-sovereign government, based on the bank’s articles of agreement. Hong Kong representatives have been involved in the AIIB negotiations as part of the Chinese delegation. As a major international banking center, Hong Kong will have a significant role to play, Jin said. China is also hosting the headquarters of the New Development Bank launched by the BRICS. Leslie Maasdorp, vice president and chief financial officer of the New Development Bank, said at the Boao Forum that the new institutions have adopted a more democratic way of working together, with no one having veto power. Maasdorp said that the emerging market is under-represented in terms of governance at large multilateral institutions. “We are working closely together with the World Bank and the Asian Development Bank because, as you know, there is such a big demand for infrastructure. There is not enough capital to fill all the gaps in terms of funding,” he said. The Asian Development Bank estimates that Asia alone needs $800 billion of infrastructure investment per year from now to 2020. What currency will be used? Maybe this is why the hesitation by the US & Japan. The reign of the USD as the sole reserve currency is in its last days. Also look for a new oil alliance on the horizon, that will challenge the petrodollar. From what I understand, China will lend out US dollars, but wants either Renminbi or euros in repayment. This is a very clever way to dump their excess dollars without having to dump them and have them lose value before they get rid of the last one. The US will never join. They are livid that China actually had the audacity to open such a bank in opposition to their interests. The present two banks under US control were designed to limit development in Asia by providing just enough funds to develop Asia enough to benefit the US economy but prevent Asia from growing beyond America’s ability to control. The AIIB will have a two prong effect. It will supply growth funds for nations to give them opportunities the American controlled banks would keep from them and also allow China new markets for goods that Americans will no longer be able to afford. The world is moving away from a system of control by one power into a multi-polar world run by groups of nations in which the socialist market economic model is the norm. In this world all currencies become reserve currencies.